We use Tracing Boards during our ceremonies to illustrate important aspects of Freemasonry to the Brethren of the Lodge. Below is the narrative which does this during the Ceremony of Initiation. The usages and customs among Freemasons have ever borne a near affinity to those of the ancient Egyptians. Their philosophers, unwilling to expose their mysteries to vulgar eyes, couched their systems of learning and polity under signs and hieroglyphical figures, which were communicated to their chief priests or Magi alone, who were bound by solemn oath to conceal them. The system of Pythagoras was founded on a similar principle, as well as many others of more recent date. 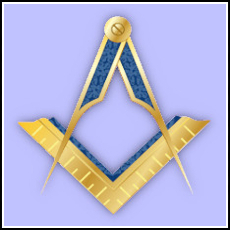 Masonry, however, is not only the most ancient but the most honourable Society that ever existed, as there is not a character or emblem here depicted but serves to inculcate the principles of piety and virtue among all its genuine professors. Let me first call your attention to the form of the Lodge which is a regular parallelepipedon, in length from East to West, in breadth between North and South, in depth from the surface of the earth to the centre, and even as high as the heavens. The reason that a Freemason's Lodge is described of this vast extent is to show the universality in the science; likewise, a Mason's charity should know no bounds save those of prudence. Our Lodges stand on holy ground, because the first Lodge was consecrated on account of three grand offerings thereon made, which met with Divine approbation. 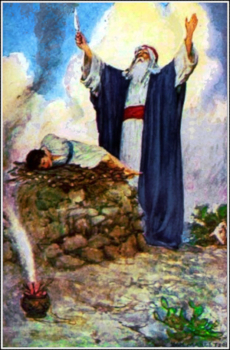 First, the ready compliance of Abraham with the will of God in not refusing to offer up his son Isaac as a burnt sacrifice, when it pleased the Almighty to substitute a more agreeable victim in his stead. Secondly, the many pious prayers and ejaculations of King David, which actually appeased the wrath of God, and stayed a pestilence which then raged among his people, owing to his inadvertently having had them numbered. 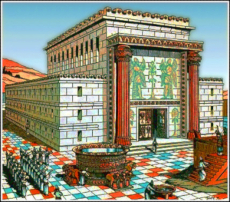 Thirdly, the many thanksgivings, oblations, burnt sacrifices, and costly offerings which Solomon, King of Israel, made at the completion, dedication and consecration of the Temple at Jerusalem to God's service. The third, last, and grand reason, which is too long to be entered upon now, is explained in the course of our Lectures, which I hope you will have many opportunities of hearing. Our Lodges are supported by three great pillars. They are called Wisdom, Strength, and Beauty: Wisdom to contrive, Strength to support, and Beauty to adorn; Wisdom to conduct us in all our undertakings, Strength to support us under all our difficulties, and Beauty to adorn the inward man. The Universe is the Temple of the Deity whom we serve; Wisdom, Strength, and Beauty are about His throne as pillars of His works, for His Wisdom is infinite, His Strength omnipotent, and Beauty shines through the whole of the creation in symmetry and order. The heavens He has stretched forth as a canopy; the earth He has planted as His footstool; He crowns His Temple with Stars as with a diadem, and with His hands He extends the Power and Glory. The Sun and Moon are messengers of His will, and all His law is concord. 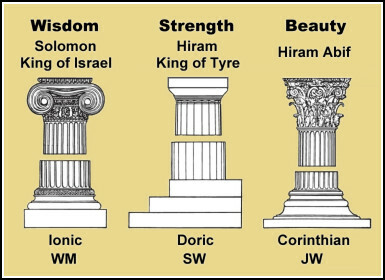 The three great Pillars supporting a Freemason's Lodge are emblematic of those Divine attributes, and further represent Solomon King of Israel, Hiram King of Tyre, and Hiram Abif; Solomon King of Israel for his Wisdom in building, completing and dedicating the Temple at Jerusalem to God's service; Hiram King of Tyre for his Strength in supporting him with men and materials: and Hiram Abif, for his curious and masterly workmanship in beautifying and adorning the same. But as we have no noble orders in Architecture known by the names of Wisdom, Strength, and Beauty, we refer them to the three most celebrated, which are the Ionic, Doric and Corinthian. The covering of a Masonic Lodge is a celestial canopy of divers colours even the heavens. 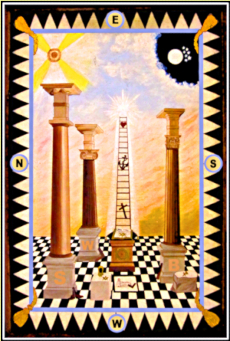 The way by which we, as Masons, hope to arrive there is by the assistance of a ladder, in Scripture called Jacob's ladder. It is composed of many staves or rounds, which point out as many moral virtues, but three principal ones, which are Faith, Hope, and Charity: Faith in the Great Architect of the Universe, Hope in salvation, And to be in Charity with all men. 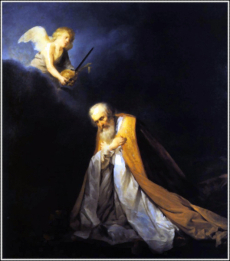 It reaches to the Heavens, and rests on the Volume of the Sacred Law, because, by the doctrines contained in that Holy Book, we are taught to believe in the dispensations of Divine Providence, which belief strengthens our Faith, and enables us to ascend the first step; this Faith naturally creates in us a Hope of becoming partakers of the blessed promises therein recorded, which Hope enables us to ascend the second step; but the third and last being Charity, comprehends the whole, and the Mason who is possessed of this virtue in its most ample sense may justly be deemed to have attained the summit of his profession; figuratively speaking, an Ethereal Mansion, veiled from mortal eyes by the starry firmament, emblematically depicted here by seven stars, which have an allusion to as many regularly made Masons, without which number no Lodge is perfect, neither can any candidate be legally initiated into the Order. 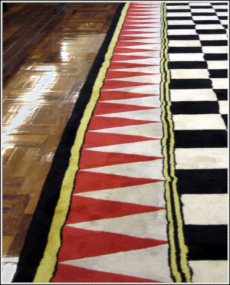 The interior of a Freemasons' Lodge is composed of Ornaments, Furniture, and Jewels. The Ornaments of the Lodge are the Mosaic pavement, the Blazing Star, and the Indented or Tessellated Border; the Mosaic pavement is the beautiful flooring of a Freemason's Lodge, the Blazing Star the glory in the centre, and the Indented or Tessellated Border, the skirtwork round the same. The Mosaic pavement may justly be deemed the beautiful flooring of a Freemasons' Lodge, by reason of its being variegated and chequered. This points out the diversity of objects which decorate and adorn the creation, the animate as well as the inanimate parts thereof. 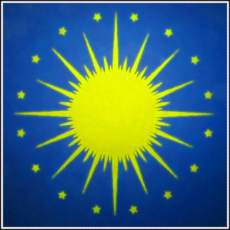 The Blazing Star, or glory in the centre, refers us to the Sun, which enlightens the earth, and by its benign influence dispenses blessings to mankind in general. The Indented or Tessellated Border refers us to the Planets, which in their various revolutions form a beautiful border or skirtwork round that grand luminary, the Sun, as the other does round that of a Freemasons' Lodge. 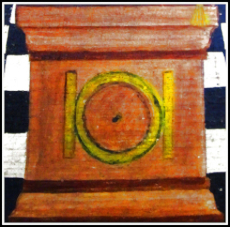 The Furniture of the Lodge consists of the Volume of the Sacred Law, the Compasses and Square; the Sacred Writings are to rule and govern our faith, on them we obligate our Candidates for Freemasonry; so are the Compasses and Square when united, to regulate our lives and actions. the Compasses belong to the Grand Master in particular, and the Square to the whole Craft. The Square is to try, and adjust, rectangular corners of buildings, and assist in bringing rude matter into due form; The Level to lay levels and prove horizontals; The Plumb Rule to try, and adjust, uprights, while fixing them on their proper bases. 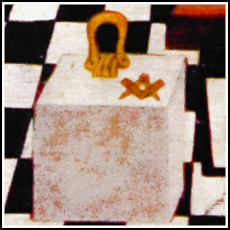 Among Free and Accepted Masons, The Square teaches morality, the Level equality, and the Plumb Rule justness and uprightness of life and actions. They are called Movable Jewels, because they are worn by the Master and his Wardens, and transferable to their successors on nights of Installation. 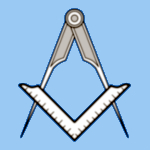 The Master is distinguished by the Square, the Senior Warden by the Level, and the Junior Warden by the Plumb Rule. The Immovable Jewels are the Tracing Board, the Rough and Perfect Ashlars. The Tracing Board is for the Master to lay lines and draw designs on; The Rough Ashlar for Entered Apprentice to work, mark, and indent on; The Perfect Ashlar for the experienced Craftsman to try, and adjust, his jewels on. They are called Immovable Jewels, because they lie open and immovable in the Lodge for the Brethren to moralise upon. 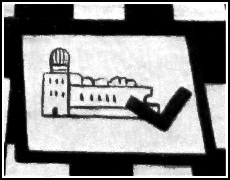 As the Tracing Board is for the Master to lay lines and draw designs on, the better to enable the Brethren to carry on the intended structure with regularity and propriety, so the Volume of the Sacred Law may justly be deemed to be the Spiritual Tracing Board of the Great Architect of the Universe, in which are laid down such Divine Laws and Moral Plans, that were we conversant therein, and adherent thereto, would bring us to an Ethereal Mansion not made with hands, eternal in the Heavens. The Rough Ashlar is a stone, rough and unhewn as taken from the quarry, until, by the industry and ingenuity of the workman, it is modeled, wrought into due form, and rendered fit for the intended structure; this represents man in his infant or primitive state, rough and unpolished as that stone, until, by the kind care and attention of his parents or guardians, in giving him a liberal and virtuous education, his mind becomes cultivated, and he is thereby rendered a fit member of civilised society. 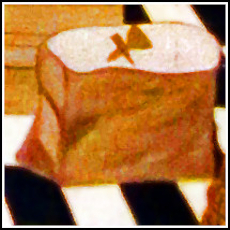 The Perfect Ashlar is a stone of a true die or square, fit only to be tried by the Square and Compasses; this represents man in the decline of years, after a regular, well-spent life in acts of piety and virtue, which can not otherwise be tried and approved than by the Square of God's Word and the Compasses of his own self-convincing conscience. 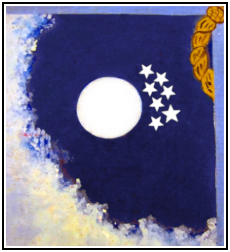 In all regular, well-formed, constituted Lodges, there is a point within a circle round which the Brethren cannot err; this circle is bounded between North and South by two grand parallel lines, one representing Moses, and the other King Solomon; on the upper part of this circle rests the Volume of the Sacred Law, supporting Jacob's ladder, the top of which reaches to the heavens; and were we as conversant in that Holy Book, and as adherent to the doctrines therein contained as those parallels were, it would bring us to Him who would not deceive us, neither will He suffer deception. In going round this circle, we must necessarily touch on both those parallel lines, likewise on the Sacred Volume; and while a Mason keeps himself thus circumscribed, he cannot err. The word Lewis denotes strength, and is here depicted by certain pieces of metal dovetailed into a stone, forming a cramp, and when in combination with some mechanical powers, such as a system of pulleys, it enables the operative Mason to raise great weights to certain heights with little encumbrance, and to fix them on their proper bases. Lewis likewise denotes the son of a Mason; his duty to his aged parents is to bear the heat and burden of the day, which they, by reason of their age, ought to be exempt from; to assist them in time of need, and thereby render the close of their days happy and comfortable; his privilege for so doing is that of being made a Mason before any other person, however dignified. 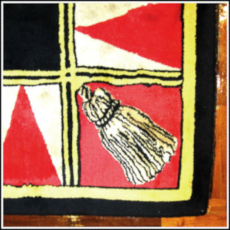 Pendent to the corners of the Lodge are four tassels, meant to remind us of the four cardinal virtues, namely: Temperance, Fortitude, Prudence, and Justice, the whole of which, tradition informs us, were constantly practiced by a great majority of our ancient Brethren. The distinguishing characteristics of a good Freemason are Virtue, Honour and Mercy, and may they ever be found in a Freemason's breast.